In 2007 St John’s Garden was designated as a sculpture garden and received People’s Lottery support to transform it from a virtual no-go area, into a landscaped space to welcome the wider community. It had been used as a drinking site by homeless people displaced from the nearby Imax cinema underpass and its labyrinth of sheltered walkways where security guards and the police had moved them on. They had found refuge in St John’s precinct where the police could not move them on (in those days) unless they were disturbing the peace. A new approach was taken, through an organisation called Putting Down Roots, part of St Mungo’s Charity and ourselves to make the space more attractive and plant the garden with interesting new species. Our role was to put in sculptures. 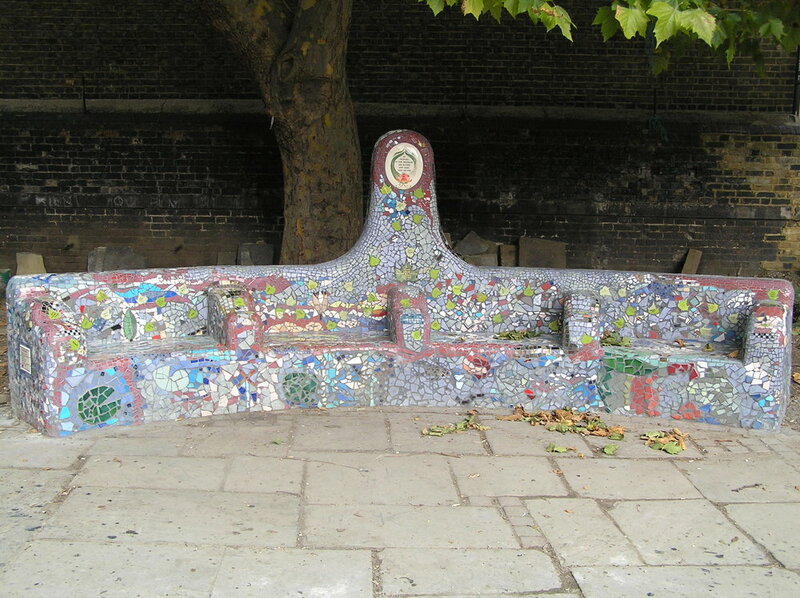 Our first aim, working with the homeless people was to make some permanent seating for them; always a difficult issue as the general feeling was that seating would encourage the homeless to sleep outdoors. We made the first memorial to homeless people, working with them and other groups at risk of marginalisation (notably young offenders). The memorial was a fertility symbol, engraved with hand-made ceramic leaves, shaped like the London Plane leaves of the tree under which the memorial sat. On many of the leaves there were names of those who had died in the garden or local hospital. Over the years we made another memorial to add names of people who died and some additional seats. We put in works of sculpture (about 20 in total) including mushroom shapes made out of tiles collected from the river Thames, a small home sculpture and a single mother sculpture with a golden child,.